Welcome to today's edition of Nerd Alert, where we have all the quirky, nerdy news that you crave in one convenient spot. What do we have in store for you on this phenomenal Friday? The 1994 classic comedy Dumb and Dumber gets reimagined as a romantic drama, a new video breaks down the problems with modern movie trailers and a comprehensive video charts the evolution of movie and TV robots. But wait, there's more! We have an amazing new Star Wars fan film and a video where Arnold Schwarzenegger shows you how to smile like the Terminator. Sit back, relax and check out all that today's Nerd Alert has to offer. Star Wars: The Force Awakens has captured the imagination of fans around the world, as it shatters box office records throughout its first month in theaters. Most fans noticed several similarities between that film and the original classic Star Wars: Episode IV - A New Hope, but now we have another video that pays homage to the original trilogy. 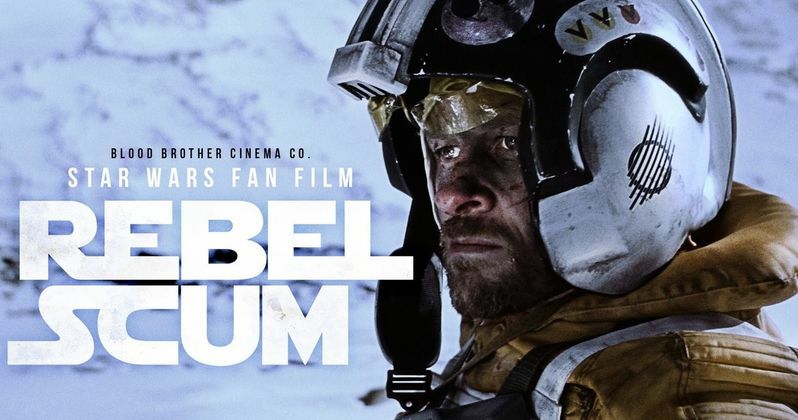 Blood Brothers Cinema has released a new Star Wars fan film entitled Rebel Scum, which follows a Rebel Alliance pilot who was abandoned during their retreat from Hoth. All of the visual effects were created without CGI, and the film was shot in location in Alberta, Canada, in temperatures as low as negative 22 degrees. Movie trailers have become a huge part of fandom, with fans eagerly awaiting to see that first glimpse of their favorite upcoming movie. Now You See It has an intriguing video breakdown that not only charts the history and the evolution of movie trailers, but explains how many fail to hit the mark they were going for. Love it or hate it, last summer's Terminator Genisys did provide another memorable moment in the Terminator franchise. During a scene where Arnold Schwarzenegger's "Pops" is taking a mug shot, he produced a ridiculously fake smile, which the actor expounded upon in a video interview with USA Today from July. As it turns out, there's a perfectly good reason for that purposefully fake smile, which may give you more appreciation for that scene. Now that the Oscar nominations have been announced, awards season is in full swing, as the countdown continues to Oscar Sunday on February 28. The fine folks at Mashable decided to put their editing skills to the test, reimagining the classic 1994 comedy Dumb and Dumber as an Oscar-worthy romantic drama. With the help of a sappy new score, you'll never look at Dumb and Dumber in the same way. Sploid's Scott Park has put together a concise yet comprehensive guide that shows the evolution of movie and TV robots over the past century. Starting with Metropolis' Maschinenmensch and going all the way up to 2013's Jaegers in Pacific Rim, this three-minute video is well worth checking out, to see how Hollywood has continually upped the ante with movie and TV robots. Over the holiday season, Netflix quietly released a new "show" on its streaming service, dubbed Oscilating Fan For Your Home. The show's premise? It's literally a video of an oscilating fan that runs on a one-hour loop. This is an actual Netflix show. Don't believe us? Check it out for yourself on Netflix. Universal's 2005 comedy The 40 Year Old Virgin became a huge hit that cemented Steve Carell's place as a viable leading man, and served as the directorial debut for Judd Apatow. Steve Carell recently appeared on Conan this week, where he revealed that the movie was almost canceled entirely by Universal, because the studio saw footage from the first few days of shooting and thought he looked like a serial killer. Hilariously enough, the actor did go on to play killer Jon Du Pont in the critically-acclaimed drama Foxcatcher. That wraps it up for today's Nerd Alert. Do you have any suggestions for future Nerd Alert columns? Hit us up on Twitter @MovieWeb and send us your suggestions, and it may even make it in the next edition. Check back on Wednesday for the latest installment of Nerd Alert.